Spain is like a bridge between Africa and Europe. 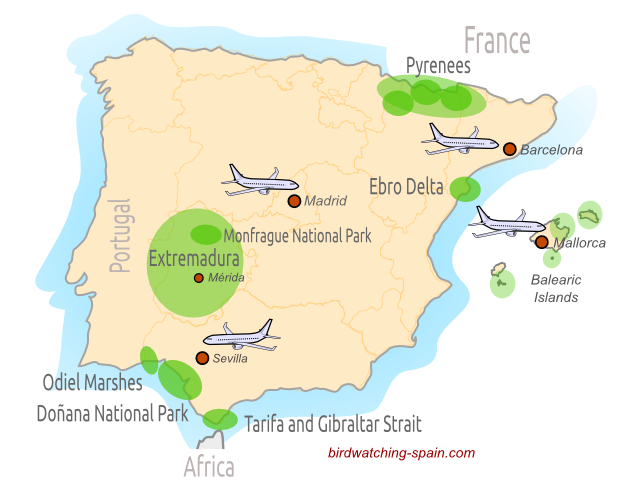 Birds coming from western and central Europe go to Western Africa following differents routes: coastal, inland..
Coastal routes are located mainly at the east of Spain, the Mediterranean coast: Catalonia, Valencia, Murcia, east Andalucia. Many birds follow inland routes looking for their favorites stopping and resting places: Castile-La Mancha, Extremadura, southwest of Andalucia.. Birds in Spain are diverse and abundant, due to a combination of factors: its geographical location, great variation in the local geography and topography, and a wide range of microclimates present in many regions. The proximity of many habitats, especially on migration corridors leads to a rich mixture of species. - Extremadura, located at the west of Spain, it's a paradise for bird watchers. Wooded pastures known as dehesas, irrigated plains, river valleys, big man-made reservoirs.. so many habitats and a region with a low human population density and low industrial activity..
- The Ebro Delta, in Catalonia, north-east of Spain. A wide range of habitats available: lagoons and reedbeds, ricefields, sand dunes and spits, saltpans, muddy bays and the Mediterranean sea. You can see red crested pochard, little bittern, purple gallinule, caspian tern, marsh harrier, greater flamingo, fan-tailed warbler, great reed warbler, black-winged stilt, night herons, great white egret, little bittern, great reed warbler, fan-tailed warbler, black-winged stilt, kingfisher..
- Pyrenees. North-east of Spain: north of Catalonia, north of Aragon and Navarra. Incredible mountain landscapes and many species to see: wallcreeper, alpine accentor, alpine chough,lammergeier, rufous-tailed rock thrush, ring ouzel, citril finch, dupont's lark, lesser short-toed lark, short-toed lark, calandra lark, pin-tailed sandgrouse, black-bellied sandgrouse, stone curlew, black-eared wheatear..
- Balearic Islands. Parc Natural De S'Albufera De Mallorca. A large wetland with very extensive reedbeds, scrapes and canals. You can see many bird species from purple gallinule, purple heron to great reed warblers. - Tarifa area and Gibraltar Strait. One of the busiest migration points in Western Europe during the autumn. Raptors are one of the most remarkable groups on the move during this period. Thousand of birds: spanish imperial eagle, golden eagel, booted eagle, short-toed eagle, black vulture, black-shouldered kite, black stork, eagle owl..